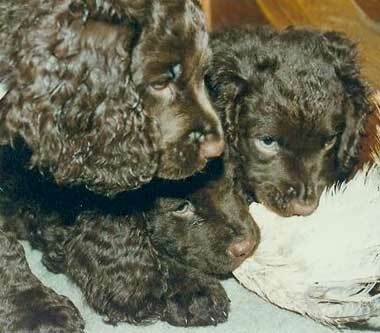 Photo of American water spaniels by Norm and Mary Kangas on Flickr (use permitted with attribution). Quote from Wisconsin Blue Book: "The American water spaniel is said to be one of only five dog breeds indigenous to the United States and the only one native to Wisconsin. A New London area physician, Dr. Fred J. Pfeifer, is generally credited with developing and standardizing the breed and working to secure United Kennel Club registration for it in 1920. American Kennel Club recognition followed in 1940. The American water spaniel was developed as a practical, versatile hunting dog that combined certain physical attributes with intelligence and a good disposition. No flashy show animal, the American water spaniel is described as an unadorned, utilitarian dog that earns its keep as an outstanding hunter, watchdog, and family pet." An active, muscular, and hardy dog, the American water spaniel has a crisp-textured, tightly curled or wavy outer coat and a protective undercoat. Colors include liver or chocolate, sometimes with a small white spot on the chest.